Controlling motors with an Arduino is more complicated than just controlling LEDs for a couple of reasons. First, motors require more current than the Arduino’s output pins can supply, and second, motors can generate their own current througha process called induction, which can damage your circuit if you don’t plan for it.However, motors make it possible to move physical things, making your projectsmuch more exciting. They’re worth the complications!Moving things takes a lot of energy. 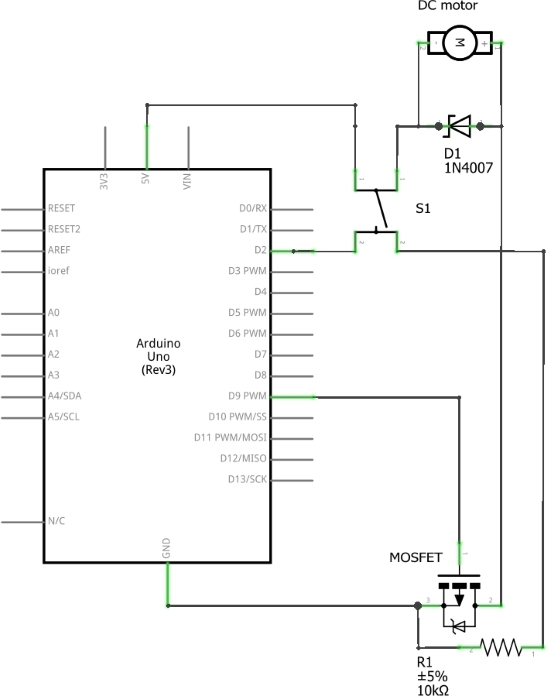 Motors typically require more current thanthe Arduino can provide. Some motors require a higher voltage as well. To startmoving, and when it has a heavy load attached, a motor will draw as much current as it can. The Arduino can only provide 40 milliamps (mA) from its digital pins, much less than what most motors require to work. Transistors are components that allow you to control high current and high voltagepower sources from the low current output of the Arduino. There are many diﬀerent kinds, but they work on the same principle. You can think of transistors as digitalswitches. When you provide voltage to one of the transistor’s pins, called the gate, itcloses the circuit between the other two pins, called the source and drain. 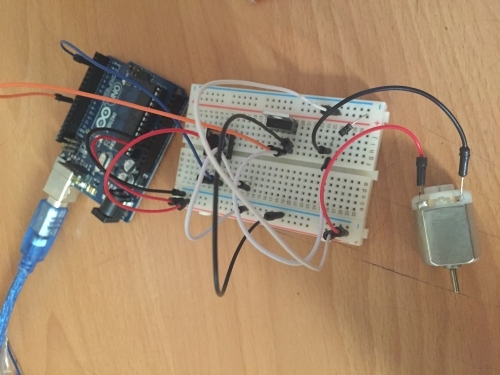 This way you can turn a higher current/voltage motor on and oﬀ with your Arduino. 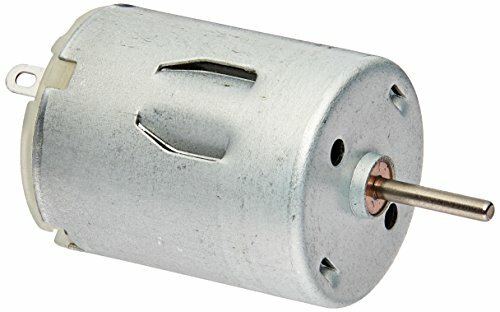 Motors are a type of inductive device. Induction is a process by which a changingelectrical current in a wire can generate a changing magnetic field around the wire.When a motor is given electricity, a tightly wound coil inside the housing of coppercreates a magnetic field. This field causes the shaft (the part that sticks out of thehousing) to spin around.The reverse is also true: a motor can generate electricity when the shaft is spunaround. Try attaching an LED to the two leads of your motor, then spin the shaftwith your hand. If nothing happens, spin the shaft the other way. The LED shouldlight up. You’ve just made a tiny generator out of your motor.When you stop supplying energy to a motor, it will continue to spin, because ithas inertia. When it’s spinning, it will generate a voltage in the opposite direction than the current you gave it. You saw this eﬀect when you made your motor lightup an LED. This reverse voltage, sometimes called back-voltage, can damage yourtransistor. For this reason, you should put a diode in parallel with the motor, sothat the back voltage passes through the diode. The diode will only allow electricity to ﬂow in one direction, protecting the rest of the circuit. Connect power and ground to your breadboard through the Arduino. Add a momentary switch to the board, connecting one side to power, and the other side to digital pin 2 on the Arduino. Add a 10-kilohm pull-down resistor to ground on the output pin of the switch. When using circuits with diﬀerent voltages, you have to connect their grounds together to provide a common ground. 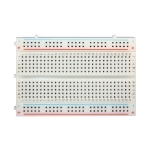 Plug the 9V battery snap into your breadboard. 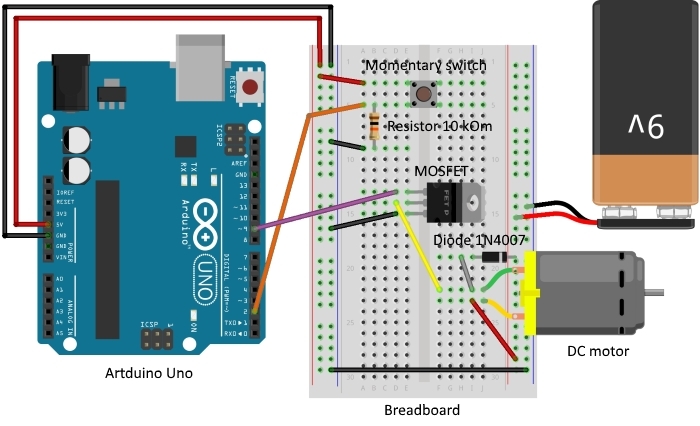 Connect ground from the battery to ground of your Arduino on the breadboard with a jumper. Then attach the motor’s free lead to the 9V power. Place the transistor on the board. Look at the component so that the metal tab is facing away from you. Connect digital pin 9 to the left pin on the transistor. This pin is called the gate. A change in voltage on the gate makes a connection between the other two pins. Connect one end of the motor to the middle pin of the transistor. This pin is called the drain. 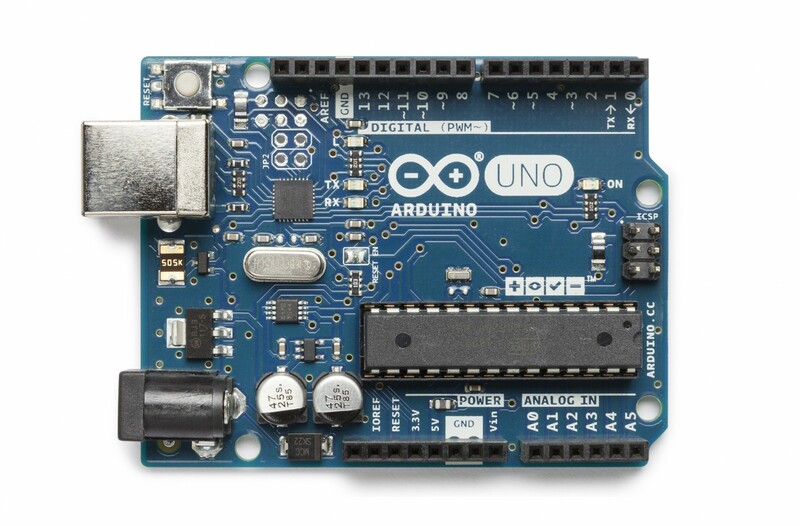 When the Arduino activates the transistor by supplying voltage to the gate, this pin will be connected to the third pin, called the source. Connect the source to ground. Next, connect the motor’s voltage supply to the motor and breadboard. The last component to be added is the diode. 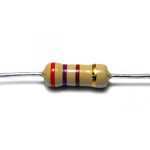 The diode is a polarized component; it can go only one way in the circuit. Notice that the diode has a stripe on one end. That end is the negative end, or cathode, of the diode. The other end is the positive end, or anode. Connect the anode of the diode to the ground of the motor and the cathode of the diode to the power of the motor. This may seem backwards, and in fact, it is. 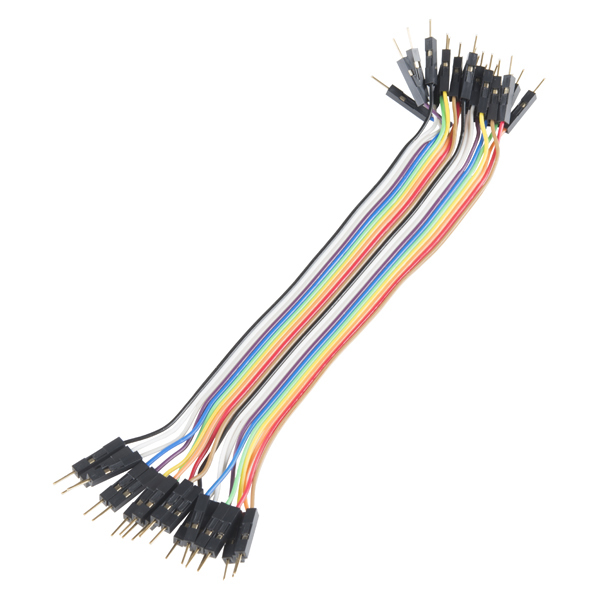 The diode will help prevent any back-voltage generated by the motor from going back into your circuit. Remember, back voltage will ﬂow in the opposite direction of the voltage that you supply. LEDs are diodes too, in case you were wondering why their leads were also called anodes and cathodes. There are many kinds of diodes, but they all share one trait. They allow current to ﬂow from anode to cathode, but not the reverse. The code is remarkably similar to the code you first used for turning on an LED. First of all, set up some constants for the switch and motor pins and a variable named switchState to hold the value of the switch. In your setup(), declare the pinMode() of the motor (OUTPUT) and switch (INPUT) pins. Your loop() is straightforward. Check the state of the switchPin with digitalRead().If the switch is pressed, turn the motorPin HIGH. If it is not pressed, turn the pin LOW. When HIGH, the transistor will activate, completing the motor circuit. When LOW, the motor will not spin. Motors have an optimal operating voltage. They will work on as little as 50% of the rated voltage and as much as 50% over that number. If you vary the voltage, you can change the speed at which the motor rotates. Don’t vary it too much, though, or you will burn out your motor. Motors require special consideration when being controlled by a microcontroller. 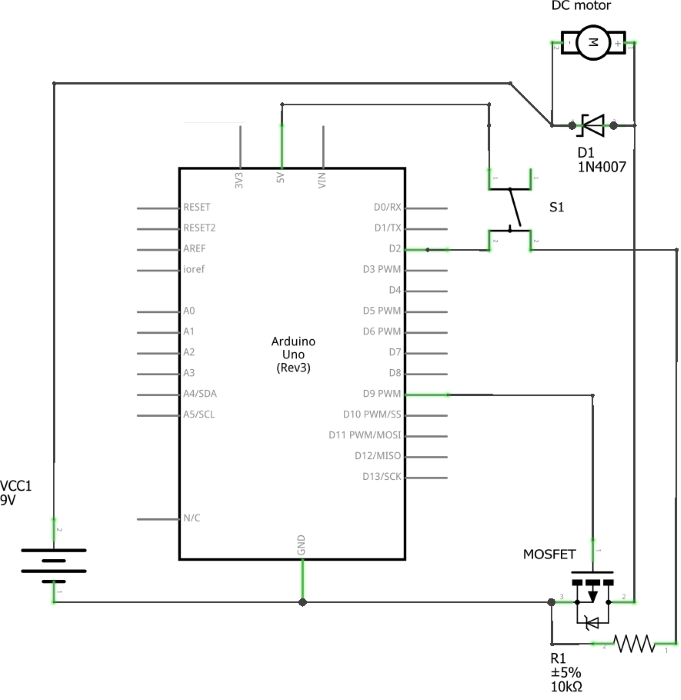 Typically the microcontroller cannot provide enough current and/or voltage to power a motor. Because of this, you use transistors to interface between the two. It’s also smart to use diodes to prevent damaging your circuit. Transistors are solid state devices, they have no moving parts. Because of this, you can switch them on and oﬀ very quickly. You can try hooking up a potentiometer to an analog input and use that to PWM the pin that controls the transistor. Just think what will happen to the motor’s speed if you vary the voltage it’s getting or can you get diﬀerent visual eﬀects if you will use your patterns on your spinner. Assemble the CD hub and attach it to the motor. Attach the die-cut paper pattern to a CD. Snap the CD to the hub and secure with a drop of glue. Allow to try before proceeding. Plug a 9V battery to your battery snap. Power your Arduino over USB. 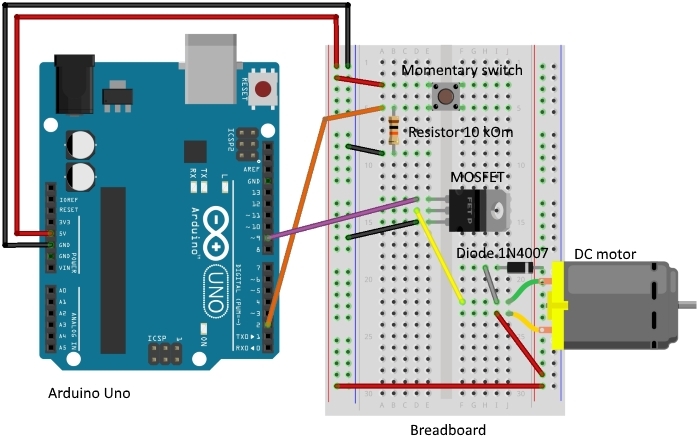 When you press the switch on the breadboard, the motor will spin very rapidly. With the motor spinning as fast as it does, you can probably make a pretty large spinner. Be careful that it doesn’t ﬂy oﬀ and poke someone in the eye. Experiment with diﬀerent paterns on the outside to create visual eﬀects.